I’m searching for any info anyone might have regarding the font in the attached image. This small bit of text was printed in 1895 by John A Lowell & Co of Boston. I’m looking to use this font to create an identity for a new business in Rockport MA and am hoping to find a complete display of all caps and an ampersand. Finding it digitally would be a huge bonus. Thank you. I can draw the lettering as vector art for you if you’re unable to find an alphabet. The face your are looking for is named Tocsin and it did include a lowercase. I found it shown on page 532 in my 1898 American Type Founders Desk Book of Printing Types produced by their Boston Branch. As usual, all of the capitals are not shown on the specimen page, nor is the ampersand. 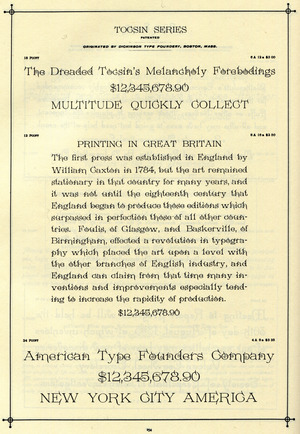 Tocsin was shown in the 1895/6 ATF “Collective Specimen Book.” They identified it there as having originated in the former Dickinson Type Foundry.